Everyone knows and most likely have heard of TripAdvisor at this point in time. For the uninitiated, TripAdvisor is the world’s largest travel site with up to 280 million unique visitors each month, 32 million members and over 150 millions reviews and opinions available online. It is traveler’s first stop to learn about a hotel they are looking into and see what other people have to say about it. And it is only growing with 90 user generated reviews per minute allowing travelers around the world to be make more informed decisions. TripAdvisor with its Business Listing service give options to hoteliers around the world to take complete advantage of the exposure they can receive. With a Business Listing you can share your hotel’s contact information, special offers, website link, and directly connect with your guests. In addition, your contact information will be displayed on your mobile listing page as well. Add up-to-date contact details to your hotel’s profile page making it easy for your travelers to book directly. Perfect place to highlight special promotions and offers attracting more travelers. This service will allow hotel subscribers to appear in Hotel Price Comparison search showing rate and availability to users. As a Business Listings subscriber, you get exclusive access to Property Dashboard which lets you access important analysis such as competitor metrics, local market trends, visitor details and overall performance of hotel on TripAdvisor. This will let you post important updates and news for the readers. In addition, the photos uploaded will automatically be converted into a slideshow for your travelers viewing pleasure. Probably the single most important thing you can do is to reply the reviews posted by users, after all that’s what people read the most on TripAdvisor. Regardless if your hotel has received a positive or negative review, it is very important that you reply to it no matter what. Just a simple a reply can put big impressions on travelers. If possible, have a dedicated person who looks after reviews online and establish the practice for managing online reviews. It is more common than you think that many times hotels might have the wrong number listed or the page has not been updated. This is probably the worst thing you could do, the traveler will most likely avoid your hotel if the information is wrong or is not up to date. Spend quality time on the description which potential guests are going to read. It is very important write a proper and detailed description of your hotel, as you are the best person to do so. Description should Speak the strengths of your location and services you provide, setting yourself apart from the competition. The best way to showcase your hotel is to have the right combination of high quality photos of your property. Have a diverse collection of pictures that not only show your rooms and lobby but also other facilities. Get creative with your pictures, take pictures of art and decor in your lobby, show case rooms with different view points, pictures of views from your hotel rooms etc. TripAdvisor regularly rewards hotels with their Travelers’ Choice Awards which cover various categories. If your hotel has received one, make sure to highlight that on your hotel website and TripAdvisor page. 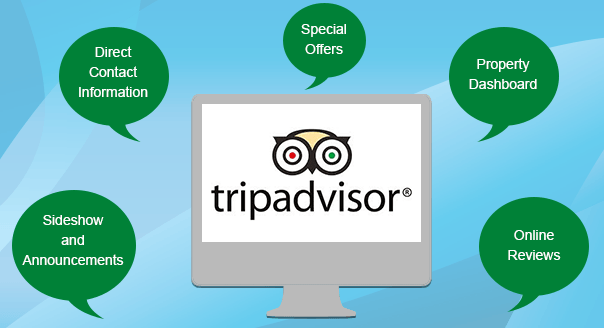 TripAdvisor with various options available for hoteliers, allow them to maximize their online presence. Hoteliers with the right practice in place can have the same exposure like big brands and increase their bookings.